Day 15: After we leave Brisbane the Pacific Highway changes into the Bruce Highway. There is a lot of traffic and road works, a trip that was going to take us 2 hours took us 4. Especially around Australia Zoo where the traffic was particularly grid locked. We arrived in Noosa and met the tour van around 4. We follow in the Jucy camper but have to turn around half way there as he left someone behind. Take 2. On the way there we stopped off at a supermarket (Woolworths) to pick up food and beer (or Goon for Alicia). When we get to Gagagu bushcamp we get shown around and cook some dinner (sausage pasta - 22 sausages for $7). That evening we sit round the campfire, play some pool and sleep in a dorm room with hand made bunk beds with hammocks instead of mattresses. Surprisingly comfy. Day 16: We have a briefing at 8 for our 2 days canoeing as it's self guided. We head out at 8:50. Getting into the water and canoe was a little challenging. It was Alicia at the front, a rather larger Canadian girl called Rachel in the middle and me at the back. I was in charge of steering (trees beware). There are about 5 canoes in total and we all paddle as a group with the tide 3.5km down river to a lake thats so shallow we have to walk a little way across it, we see a stingray in the water too (Steve Irwin beware) our destination was a small beach where we upturn our canoes and have a half hour walk to another beach on the sea. We enjoyed a couple of beers, some lunch and a walk up and down. We stay there for about 5 hours, after which time a lot of people we very sunburnt (Alicia not included). We head back about 3:30 again with the current and get back around 5. We shower in on/off warm water that is actually brown in colour then move out of our dorm and into a tent for a night of bushcamping. No briefing today. We set off at 8:50 again with a new load of people. It seems no one has paid for this trip and it's been thrown into everyones Fraser Island package. We head up river 8km today against the current which was hard going. Rachel insisted in being a front seat driver (think backseat driver, but she was sat infront of me). After a couple of hours canoeing we reach a large lake which is knee deep practically the whole way across. We sit on the beach and relax for a bit. Alicia, Rachel and I head to the oldest pub in Queensland to have some lunch (steak sandwich for me, chicken burger for Alicia). We start canoeing back about 2. On the way we stop at a creek we had been told about that has a rope swing into the water. It added an hour or so onto the trip, but was worth it to get in the water. By this time of day it was pretty humid. The first guy climbed the tree and swung in. It was only when he was swimming back to shore that he discovered a branch just under the water and a sharp broken branch protruding upwards only a foot from the surface (hidden by the murky colour of the water). As someone could easily fall onto it, someone stayed in the water on the branch so people knew where not to land. We would discover later though that it wasn't the only danger in the water. That evening the 2 guys that arrived first saw a water snake swim away from the rope swing area and then dive under the water, but didn't tell us because they thought not one would go in the water....hmmm. We have a good time swimming and swinging into the water for an hour or so but decide to leave as we can see a storm getting closer. Pretty much all the way back it was a full on thunder and lightning storm, rain, wind, the works. We try to stick close to the shore as much as possible and funniy enough we all a lot quicker getting back than on the way out. Alicia's arms seem to regret it later in the evening though. We get back about 6, make dinner and relaxed. It was a fun evening, people sat down with beer and goon. Alicia played some drinking games and truth or dare, I watched "I am legend" in the TV room. Unfortunately it ended with an argument (proper arguing, with shouting and all) with Rachel as she was convinced Soy Sauce had more salt, than salt. No that's not a typo, it was the most retarded conversation I've ever had and we probably should have let it go in hindsight. But we have generally found Canadians to be very opinionated and especially annoying - they generally are under the incorrect assumption they "aren't as bad as the Americans" and we just couldn't let this one slide, with it being so very, very stupid. She still left thinking she was right though. After a poor night sleep the night before we opted to sleep in camper. One night of bush camping is enough to say you've done it. Day 18: It was a good night sleep in the camper but once again we were woken up by the sound or all kinds of crazy sounding birds outside. We pack up and head out about midday. We head back to Noosa as I had heard it was the last good place to surf before you have to worry about jellyfish. We arrive in Noosa about 2, I decide not to opt for the lessons as they were $60, but instead just to rent a surf board for 2 hours ($20) and see how I get on. The waves are really good for beginners, the water is shallow and there are no rocks. I manage to stand up and ride some good waves, although I was still only hanging about 1.5 out of the possible 10. I still had fun and feel I made good progress. Alicia even came in for a bit managing to body board back to shore. We shower in the cold showers at the beach and head off to our free rest stop for the night. It's around 2 hours drive to the Petrie Park Rest Stop, but it's close to Hervey Bay (our destination the next day). The stop was set on a fishing lake 1km from the Bruce Highway. Very pleasant. In the evening I spotted an owl sat on one of the park benches, we mange to get within 3 feet of it. It didn't seem to care. It did look like a bird we saw in the Lone Pine Reserve called the Tawny Frogmouth. We also saw a couple of frogs hanging around the loos. Sausage pasta for dinner with Austin Powers on the DVD player. We can watch Austin Powers now because Freddo has a different type of DVD player to Bertha and the USB with all our films actually works! What a bonus. Day 19: We head up to Hervey Bay as this is where we start our Fraser Island trip in the morning. It takes us a few hours to get there and we arrive about 1pm and check in a hostel which is included in the trip. We are greeted by the most excitable person ever (she added "yaaaaaay" on to everything. "your here! Yaaaay", "Fraser tomorrow then? Yaaaaaay", "here is your room key Yaaaay" etc). We park our car in the carpark, have a really nice shower and wait for the trip briefing at 4pm. The briefing goes through the usual stuff such as departure times. I ask about the weather forecast (it was cloudy and grey at the time), he says the weather on Fraser is "dynamic", so I wasn't holding out much hope. When the briefing is finished we head in a minibus to the bottle shop, Alicia buys more Goon, I still had beer, and sone ciders for that evening. After we head to the supermarket (Woolworths again) and split our shopping with a German guy called Phil it came to $18 each for the basics. The trip will be 3 days 2 nights overall so although we don't need much, the amount of people we have on the trip makes for a crazy amount of food. In the evening we pack our bags, cook (pasta with carrot in sauce. Not a feast but we did have tinned rice pudding later) and head to bed about 10. We have to be checked out of the hostel by 6am ready for a safety briefing at 6:30. Day 19 (Fraser Island): We wake up early, check out and head down to the safety briefing, we are greeted by our guide a foul-mouthed biker and ex semi-pro rugby player called Summy (real name was Pete). He says we need to watching the video, even though "it's the most boring s*** you'll ever see" after we hear about Dingo dangers and driving on sand we leave, or as Summy frequently put it "right then, let's f*** off". People who want to drive put their licenses in and we all picked one of four cars. In our car we have 3 Swedish lads, Phil and a crazy British guy called "Chris" who really was the life of the party despite first impressions of him being a bit weird. It turns out though that initially I was the only one that would be driving! Phil did agree to do some after a while though. We pack our stuff into our massive 25 year old Toyota Land Cruiser and headed in convoy to the car ferry. We get to Fraser Island and after a short briefing, we stuck our vehicles in low range 4 wheel drive and headed out into the sand. As Fraser is the largest sand island in the world there is a enough sand to go around. Driving on sand is similar to driving on snow, you have to be careful with the steering and acceleration but Summy says to ignore the safety DVD and we need to put a lot of power down through the soft sand instead of taking it steady. It was very fun, it was also very bumpy and hard to keep in a straight line without fishtailing off into the bushes. It was great. Everyone seemed to have a good time in the back too. First stop was central station, a rainforest walk with a stop with a nice clear river where we saw an azul kingfisher. Then we travelled through some crazy tracks to our second stop at lake birrabeen. A lake that was fed only by rainwater (called a perched lake) and sand that was made from 90% silica making it extremely fine and white. Third stop of the day was lake Wabby. Getting there involved a drive down the main beach which was treated like a road, with speed limits and police patrolling. Lake Wabby which was a tea tree stained lake surrounded by big sand dunes that you could run down into the water, or forward roll as Chris did. We went to camp driving along the main beach, avoiding the waves. We cooked burgers and sausages on the BBQ for dinner. Alicia drank Goon, I was on "Tun" larger. It was a really great night until one drunk English lad mouthed off to Alicia for her crime of walking to the car. An argument ensued and it ruined the night to be honest. First stop (to get rid of hangovers) was a brief visit to Eli creek. The creek comes from the other lakes to the sea which filters out a lot of the salt but not all of it which gives it an interesting taste. Most importantly though was the current, it allowed you to lay in the crystal clear water and float down it. The only downside was it was freezing. We then had a short drive up to Indian Head, we park our cars and a walk onto the cliff top which gave us nice views over the length of the beach and out to sea where we spotted small sharks, a Manta Ray and Humpback Whales. After Indian Head we travelled further up the beach to the Champagne Pools at the top of the island, called such because the sea washes over the rocks into the rock pools and creates bubbles. Surrounding the rocks of these pools were these strange lympet-type creature that of you pushed the side of the would squirt water like a water pistol. Hours of fun. Back down the beach we stopped the ship reck of the "Mareno". It was sunk in a cyclone then used as bombing practice for Aussie and American planes. Waves crashed through the 100 odd metre rusted hull impressively as the tide came in. We also managed to watch more Humpback Whales from the shore. Before returning to camp we pop back to Eli creek to try to wash the salt off a bit and for more floating time. 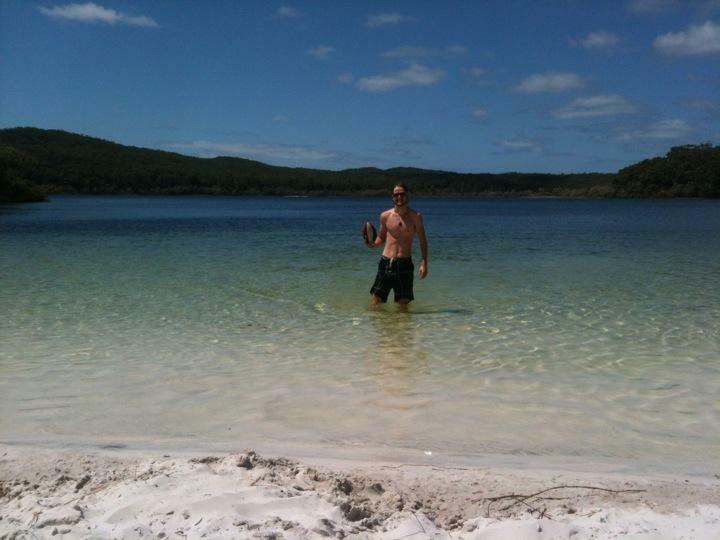 Day 21 (Fraser Island): Got up at 6:30, I drove inland through some rough roads of soft sand. It was more bumpy fun. Lake Mackenzie was our destination. Another perch type of lake with sand that was 98% silica. It was so pure and fine that it makes your hair softer and if you rub it into your skin, it exfoliates it. The lake was really clear in parts but freezing cold. I went for a swim and chucked a ball around with Chris and Phil for a hour or so whilst Alicia sun bathed with a Kathy a girl from Manchester. We got the 1pm ferry back to the mainland. Dropped our stuff off at the hostel then headed straight out for the AFL (Aussie Rules) grand final game between the Sydney Swans (Summy's team) and Hawthorne Hawks (Chris' team - which made for some good banter over the previous few days). The game was a good one with only 1 kick in it with only minutes left to go. Sydney won in the end much to the disappointment of Chris who had been obviously excited for the whole trip back. A short walk along the beach on the way back and back for a long overdue shower and a relax. Fraser Island was definitely one of the most beautiful places we have seen on our trip so far.